The former British Prime Minister Harold Wilson is supposed to have said that ‘A week is a long time in politics.’ The same might very well be said of pro-cycling and it has most certainly been a truism in this incredibly eventful opening phase of this years Tour de France. Just 10 short days ago we watched 198 riders roll out of Leeds and head North into the Yorkshire Dales with Mark Cavendish eyeing up a yellow jersey in Harrogate. It feels like a lifetime ago. So much has happened, there have been so many twists and turns, and so many retirements, that it seems as far away as the opening week of the Giro. We had pre-race favourites aplenty, expected battles aplenty and expectation aplenty. Sure, we knew that there were some tricky stages in the opening week and we expected someone to lose the chance of a the win on the cobbles on Wednesday but, like Monty Python’s Spanish Inquisiton, no-one expected the carnage we have witnessed. Cav down and out with a bang on Stage One. Andy Schleck retiring with a whimper on Stage 4. 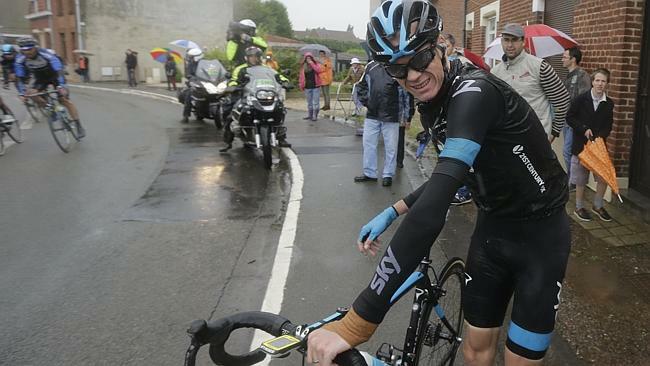 Chris Froome hitting the deck three times before bowing out with fractured wrists even before the reaching the infamous cobbled secteurs. And then yesterday, Alberto Contador’s sad exit; riding on for 20km with a broken tibia before putting an arm around a team mate and pushing him onwards, further along the road which he could no longer travel. It’s certainly been attritional. And that is just the ‘big’ names. The list of retiree’s is long and could yet eclipse that caused by the ‘massacre of Metz’ in 2012 The racing has been hard, hard, hard with GC contenders to the fore as early as stage 2 when the one man who hasn’t yet put a foot wrong, Vincenzo Nibali, broke clear in Sheffield to take the win. Of the main contenders, he alone seems to have avoided incident, ridden perfectly and been least troubled by the parcours. His stage 5 run on the cobbles was magnificent and his two stage wins (stage 2 & stage 10 up the murderous slopes of the Planche des Belles Filles) have placed him in an enviable position at the head of the leaderboard. But it is what is going on behind him that now intrigues. With no former winners left in the race we are guaranteed a new name by the time we reach Paris. With his full team still intact, and a 2 minute 23 second cushion to second place man Richie Porte, Nibali looks to hold the most cards. Valverde – my early pick for the podium alongside Froome and Contador – lies third but had been almost anonymous. The way that the race has opened up because of the enforced exits of first Froome and then Contador offers a thrilling prospect of a continuance of the exciting racing we have seen so far. Numerous riders hovering in the top 10 will now believe that they have an opportunity that would not have existed had those two geants remained upright. The French in particular will be hugely excited, with four riders occupying positions in the top 8 and the prospect of a podium at least very much on the menu. Whilst this years parcours has definitely lit up the race, as with the Giro, the weather has also played its part. Unlike the Giro though – where riding piano became a regular feature – poor weather has not seen a cessation of racing in Le Tour. Stage 5 was run in abysmal conditions – not even the Spring-held Paris-Roubaix has had a wet edition since 2002 – and shattering rainstorms have been a feature since the race entered the Vosges this weekend. How distant then, how remote does the sunshine and certainty of Yorkshire feel? By turning the meteorological formbook on its head and kicking the Tour off with two massively popular, massively exciting stages, Yorkshire set the tone for all that followed in the Tour’s first week but, as with the Cote du Jenkin’s Road, added in twists, turns and stings in the tail that have us left us all reeling just trying to keep up with the onslaught of action. I’ll be writing separately about my time up in Yorkshire but it’s only fair to say that the county delivered on it’s promise to give the Tour ‘the grandest Grand Depart ever’ in spades. Even the hammer-blow of losing Cav on Stage 1 did little to derail the joyous atmosphere or dampen the party spirit in the North or on the road from Cambridge to London. The Tour entourage – and the riders in particular – must have been glad to get back to the ‘quiet’ roads of France for a breather. But there was no such respite for Froome. A clipped wheel on stage 4 brought him down and he looked half the man from then on. The challenging weather on Stage 5 and the peloton’s headlong rush to get the pave at the head of the pack sent nervous tension skittering through the pack and the tumbles started almost as soon as the racing did. 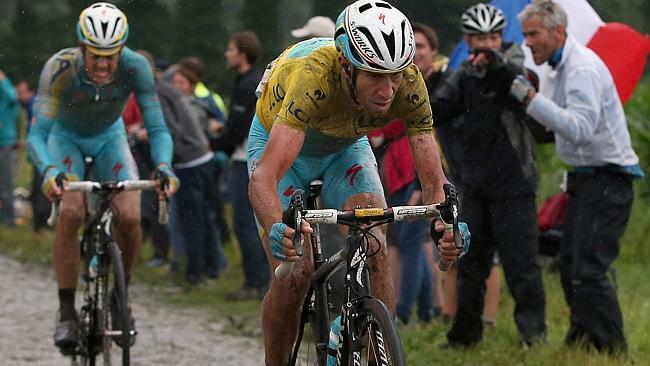 Down once, down twice and then, as with Cav before him and Contador after him, it was clear that his race was over. The head dipped, the body went this way and that – not sure whether to go on or not – and then the realisation. Game Over. Contador – incredibly given what we learnt later – did go on after his high speed chute. For 20km, up a Cat 1 climb, overtaking a fair proportion of the peloton as he sought to try and catch up the 4 long minutes he had lost at the roadside after crashing on the descent of the Petit Ballon. But, in the vision-limiting mist at the summit, he also finally faced the truth and watched his team’s Tour dreams go on along the the road without him. 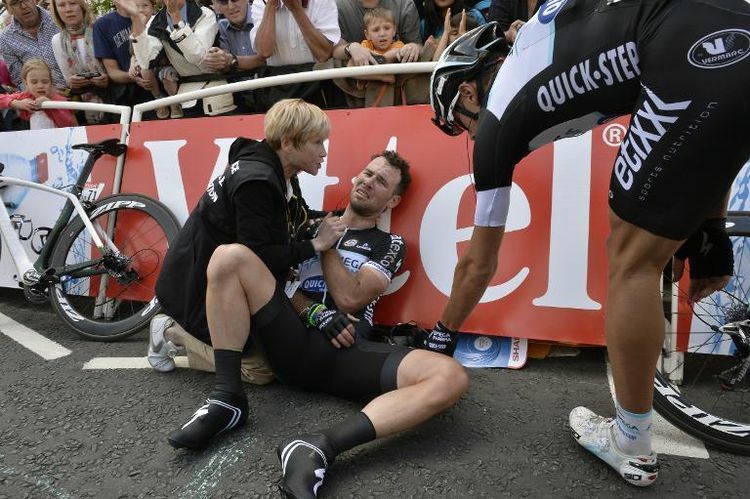 He got into the team car in tears, his hopes as broken as his leg and as tattered as his jersey. Quite rightly, much has been talked and written this week about war. About the losses, the impact and the senselessness of the conflict that scarred the land through which the Tour has travelled this week. Harold Wilson would have been alluding to the pace with which events happen in politics and how new events can quickly outpace things which were current only hours before. War – and the Great War in particular – moves slowly but a week in the trenches would have felt like a lifetime I am sure. For many millions it was a lifetime, in the sense that theirs ended there. — Lunchtime Update — With the mystery of the breaking frame now seemingly put to rest by Alberto Contador, who has confirmed that he hit a pothole whilst eating an energy bar on the Petit Ballon descent, we can look at little further at the winners & losers this week. Winner One is German Cycling. Six of the opening ten stages have been won by German nationals with one day in yellow and two different wearers of the Maillot Pois of the King of the Mountains jersey. Whilst Marcel Kittel has reigned supreme in the sprinting stakes, Andre Greipel, Tony Martin and Jens Voigt have illuminated the races with the verve of their endeavours. How much longer can German TV continue to turn its back on the sport? Winner Two is Peter Sagan. Despite now actually winning a stage outright he finished in the top 5 in the first six stages and had already almost wrapped up the Green jersey competition. That finish streak reads as follows: 2, 4, 2, 4, 4, 5, 2 and that last second place was less than an inch off the win. An incredible feat of consistency. The big losers this week are Specialized who came under (misdirected) fire for the Contador crash. They appear to have been exonerated now but it shows that ill-feeling towards to the company is still an undercurrent following the Cafe Roubaix debacle in the run-up to Christmas last year. Nice piece, you write well. Thanks Stewart. Glad you enjoyed it.